How cute!! 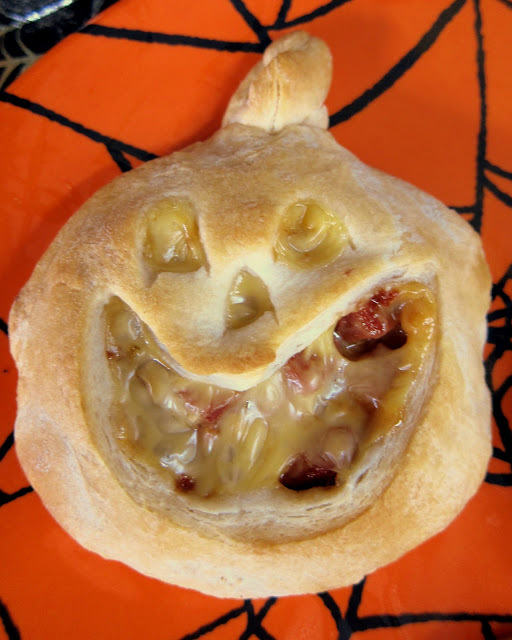 These Halloweenie Pockets are a twist on crescent dogs. We chopped up hot dogs, tossed them in BBQ sauce, topped it all with cheese and stuffed it inside a jack-o-lantern biscuit pocket. This idea came from Chicken Legs, which is odd because he hates hot dogs. I wasn't sure he would eat them, but he did and loved them. I have to admit, they were really good. I really liked the BBQ sauce. These are so much fun to make and eat! They are the perfect lunch, snack or dinner for your little ghosts and goblins this Halloweenie! Dice hotdogs and toss with BBQ sauce. Separate each biscuit into to layers. Flatten each layer into a 4-inch circle. Top one layer with some BBQ hot dog and half a slice of American cheese. Using a sharp knife, cut out jack-o-lantern faces from remaining biscuit layer; place over hot dog mixture and pinch edges to seal tightly. Roll scraps from face cut outs and use as the stem. Repeat with remaining biscuits. Well those fellows will fool you all the time. I've been eating cheese grits for years. My hubby would not touch them. I think these would be excellent with diced/cubed ham, minus the bbq sauce. They are adorable. Sarah - you can call them Hammieween Pockets - YUM! These are so cute! I'm super impressed that Chicken Legs came up with them. :-) I just might have to try these! It would be fun to try different fillings, too. So fun! I'm going to make these asap. I think they would be super tasty with a modified chicken pot pie filling too! I just found this site on Sunday and have already made three things (skillet bread, pot roast that uses three packets and the crack potatoes). My family is in heaven and my freezer has pot roast and potatoes for another meal. Thanks very much for all the hard work you put into the site and the recipes. OMGosh! These are too funny! I love how some of the filling is oozing out of that one pumpkins mouth! So gross and fun all at the same time. I love this idea Stephanie! Perfect for Halloween night before or after trick-or-treating! Cannot wait to try these for the kids! You rock! I made these for my two boys along with some green macaroni oozing out of the mouth. They loved it! Such a cute idea!